As part of a great tourist and cultural campaign the Ministry of Tourism organized last month, the Ministry invited eight European artists to translate their aesthetic views on Yemen into pieces of art.The result was a group of truly wonderful works, capturing various aspects of Yemeni traditions and geography. The gallery took place for one week, July 15-23, giving art tasters a chance to savor Yemen’s beauty from a European point of view. Eight European artists formed the exhibition after two weeks of hard work and painting. The artists were Edllardo Laborde and David Gonzalez from Spain, Charles Foster-Hall and Philip Brahan from the United Kingdom, and Charlotte Jaunez, Aurelie Pedrajas, Stephanie Ledoux and Philippe Bichon from France. Each one’s works depicted Yemen from different aesthetic perspectives, giving the exhibition excellent variety. British painter Charles Foster-Hall (of the Royal Watercolour Society, London) presented Sana’a like he was one of its people. Clearly, the creative painter with only two weeks available to paint, he did a great job, capturing simple yet profound details about Sana’a. “I was invited by Yemen’s tourist ministry to come and paint in and about Sana’a and do an exhibition with eight other European artists. Consequently, we got to Sana’a, painting very hard for two weeks to put the exhibition together. We have been working sometimes till 4 o’clock in the morning, getting paintings ready. Basically, it has been a fantastic trip and we had lots of inspiration,” said Foster-Hall. The fact that they had some days when they were up painting until 4 am demonstrates how driven those painters were about their works. “When you are a painter, driven and get good inspiration then you can’t do anything else but paint. I’m very pleased to see the final result; all the paints on the walls,” said Foster-Hall. 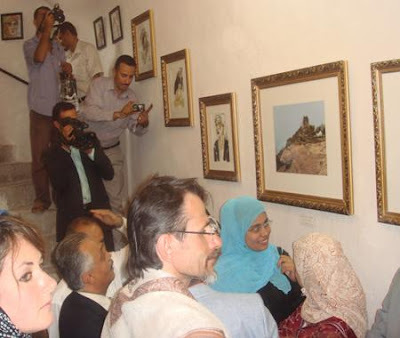 French painter and illustrator Aurelie Pedrajas was also invited by the ministry to participate in this exhibition. “This is my first time to Yemen and I like it very much. In my paintings my message was to show Yemen the way I felt it,” said Pedrajas. Each painter depicted Yemen with a message he or she wanted to convey. For Bichon it was to present drawn old buildings beautifully since his career’s specialization is in old buildings. “I draw old buildings and portraits but I prefer to stick with the architectural aspect in my paintings. In Yemen, I could get inspired anywhere by its architectural beauty which is found in the whole country,” said Bichon. “For next year, I will publish a calendar that’s about Yemen. I normally publish this for my family and friends only but I really would like to do it this year in cooperation with the Ministry of Tourism and print more in Arabic, French and English and share it with the maximum number of people,” added Bichon. Foster-Hall concluded by saying that the message in his paintings in this exhibition was to enjoy beautiful Yemen, the fantastic architecture and its unspoiled originality.